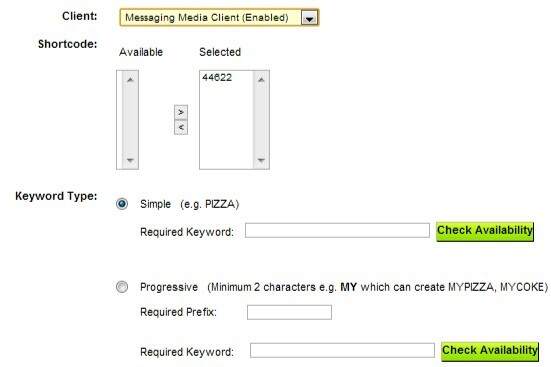 Keywords are simple unique, identifying words that through text messages make your text message campaign as effective as possible. When someone texts your keyword, it triggers your campaign that you created to launch on the users device. Often, a simple keyword is the most effective as it is easy to remember and text. In the topics below we explain how to create and manage keywords. You may access these tools from the SMS Campaign menu in the Textboom toolbar or from the quick link icon on the Dashboard. The Keyword Manager displays a listing of all keyword records for your account. You can filter by OC (Operating Company), Agency, Client, Status, or Short Code. You can edit, disable, re- enable, and delete campaigns. You may also perform a search for a specific word or number. The listing will change to match any filters that you apply, and you can combine several filters to make your report very specific. To clear away any filter, you can perform a reset at any time. You may access this feature by choosing SMS Campaign > Keyword Manager from the toolbar. On the left side of the report control panel, you’ll find a group of filters (below). Choose from one or more of these drop-down menus to filter by OC (Operating Company), Agency, Client, Status, or Short Code. New – add a new keyword. Disable – Click this icon to disable the keyword. A disabled keyword cannot be used again until it is enabled. Delete – click this icon to delete a keyword. A deleted keyword is both disabled and invisible. The figure below displays the first few column headings. Underneath these headings, you will see a list of all your keyword listings. Click this icon to edit the keyword (you will exit the Keyword Manager). Click this icon to enable the keyword. Click this icon to delete a keyword. A deleted campaign is both disabled and invisible. With the Keyword feature, you may create a new keyword for use with your campaigns. You can create a simple keyword, or a progressive keyword that has a prefix that you might use with other keywords. Read below to see how easy it is to setup. Or by clicking on New from the Keyword Manager. Click the Client drop-down list, then select the correct client name. Enter a Name for the keyword. To choose a Shortcode, click the database name in the Available listing, then click the right arrow to move the database name to the Selected listing. Next, decide if you want a Simple or Progressive type of keyword (Keyword Type). 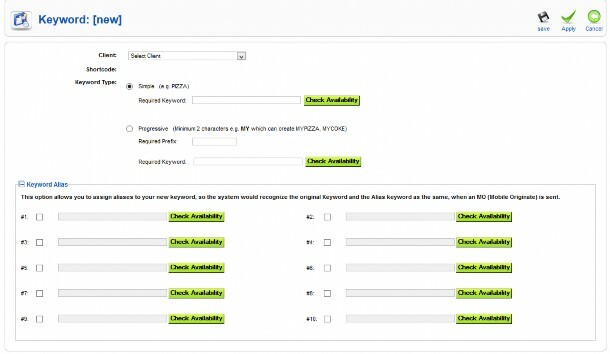 If you want a Simple keyword, type the keyword into the field for Required Keyword and then click the Check Availability button. You’ll receive a confirmation message if the keyword is available or an error message if it is not. If you want a Progressive keyword, first type the prefix word into the field for Required Prefix. This will prepend the prefix to the Required Keyword field. Next, enter the keyword into the field for Required Keyword. Then click the Check Availability button. You’ll receive a confirmation message if the keyword is available or an error message if it is not. At the bottom of the page, click the plus (+) sign for Keyword Alias to expand that section. Check the box for #1, then enter the alias keyword and click Check Availability. You’ll receive a confirmation message if the keyword is available or an error message if it is not. If you want to enter more aliases, check the boxes and enter keywords for #2, #3, and so on.